We all need a little light in our world. But the kind of light we need isn’t produced with electricity, filaments and inert gases. Sure, these can and do produce light but this light will eventually fail as filaments burn up and electricity goes out. There is darkness in the world. Turn on the TV, open a newspaper, listen to the radio if you want the darkness. Everywhere you turn is darkness. The light from even the brightest bulb cannot shine into this darkness. There is only one light that can break through the shadows and peer deep into this darkness. As it shines forth it breaks the darkness apart weakening it’s grip and eventually driving it out. It’s a light that each and every one of us is capable of producing and displaying on our own. The light I am talking about shining is LOVE. Where will you shine your light today? I like this picture man. That is awesome. I am not sure where the effect of the dust looking stuff came from or how you did that. But I love it. Well done. As always I love you stuff. Thanks Tim! 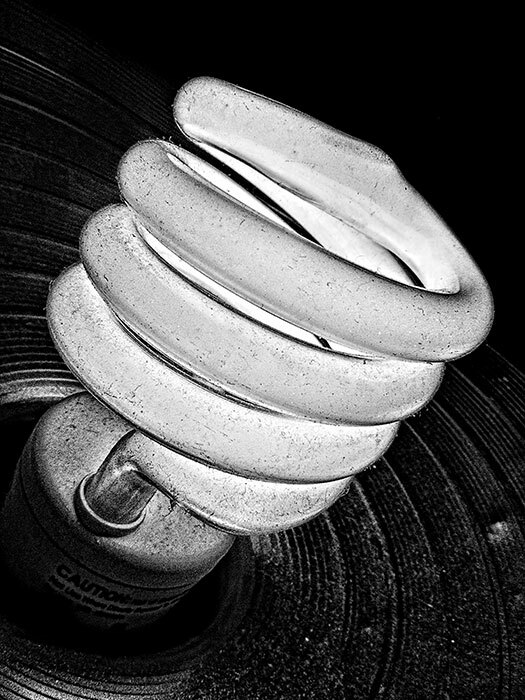 Yeah, that is actual dust on the bulb that got enhanced when I applied a Topaz Labs filter to it. Then I converted it to a high contrast B&W image. I like how it came out.